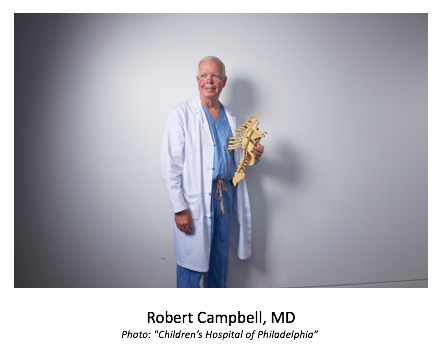 At the 2018 National Organization of Rare Diseases (NORD) Rare Impact Awards, Rare Disease Report had the opportunity to sit down with Dr Robert Campbell, Jr., MD, of Children’s Hospital of Philadelphia (CHOP), who was presented with the Lifetime Achievement Award for his groundbreaking work in thoracic and pulmonary disabilities. Among other topics, Dr Campbell discussed the key points one should keep in mind when taking on a rare disease and how critical it is to take chances when working to develop innovative treatments. Rare Disease Report®: You created the Vertical Expandable Prosthetic Titanium Rib (VEPTR). What was the process and experience like? Were you inspired by anything specific? Campbell: It had to be done. There was a life that needed to be saved, and the only way to do it was to do something radical like invent a device that is really founded in a new specialty of medicine. A child was in danger, and it was done to save his life. Now, these operations are done in 27 countries, thousands of children have been treated through the years, and it is the standard of care for these rare spine and chest problems. It has just turned into a monster through the years. I spent my career teaching it, advancing it, and operating on well over a thousand of these children. It’s the path I never thought I would take, but here we are. RDR®: Which types of rare diseases have you experienced in your career, and what are your methods and treatment approaches for treating them? Campbell: My message is simple: I ask my fellow spine surgeons, when looking at the chest, to not just look at the spine, but to look at everything. Look at the lungs, look at the rib cage that may be denting into the lungs and preventing lung growth. That has been my plea to my specialty all these years, and we finally get it that we have to stop ignoring the child and treating an X-ray or the chest and lungs. If we can open up the chest and make it larger, we can help lung growth. RDR®: Needless to say, these are very serious diseases you’re treating? Campbell: Absolutely—the world’s rarest diseases. I treat children where maybe there’s only 10 cases ever reported, and they come from all over the world to CHOP for a multi-specialty team to take care of these kids, and that’s the best way to do it. Rare diseases—I could spend the next 40 minutes just telling you the names of them, but the common component [in thoracic and pulmonary rare diseases] is that they have a spine that is malfunctioning and a chest that doesn’t work. Because your lung function depends on chest wall function, if it doesn’t work, you can’t breathe, and sooner or later it’s going to get you. And so, many of these diseases, when untreated, have a very high mortality rate. RDR®: From your experience, how important is communication among physicians of various specialties who treat children with rare diseases? Campbell: It’s critical. There’s a fair amount of gray hairs [experienced physicians] that have seen it all—but they haven’t. We have to trade notes on this. None of us have seen a thousand of these children. I see more than most, but some very expert people around the world will give me a call about something. We constantly have to communicate to do the best job possible for these kids because there’s not much known about how to treat them and what works and what doesn’t work. A lot of it is what we call ‘anecdotal,’ where somebody does something, it works, and the results are passed on verbally. It’s sort of an ancient way to do it, I guess, but kids with rare disease—they deserve a break. RDR®: Do you believe in the team approach (a group of specialists treating a rare disease rather than just 1 physician)? Campbell: Absolutely. It’s the best way to go for many reasons. We help pioneer that in treating the diseases that we’ve seen. We very quickly got an expert pulmonologist to see the kids we’re trying to evaluate, and we also brought in a pediatric general surgeon who’s an expert in the rib cage. Why not have 3 experts at the table? It’s amazing what I’ve learned from my pulmonary colleagues and general surgeons. They’ve taught me a lot, and we’ve taught them a little bit, too. It’s really best to involve all the experts because you get advice, and then the ultimate plan is better than [something] any 1 of us could have come up with [alone]. RDR®: General pediatric physicians are most often the first to encounter a rare disease. What do you feel they should know and look for with rare disease, and when should they pass these patients onto specialists? Campbell: If you have a very young baby with a spine deformity you see on an X-ray, you have a horrible problem. Any pediatrician with a baby coming in with 90 degrees of scoliosis or missing vertebrae (parts of the spine that form the actual spine) needs to refer that child to a specialist, and at minimum, refer that child to an orthopedist. That physician can then sort out where the child needs to go. A lot of times, these kids are already in respiratory crisis, and so the pulmonologist notifies us, and we start dialoguing. With emails, it’s so easy to trade notes worldwide. Those things that people are uncomfortable handling in their home institutions, we’re glad to see those referral patients at CHOP. RDR®: You also support education programs among rare disease patients. How important is patent involvement and self-advocacy in a rare disease? Campbell: It’s very important. Yearly, we sponsor a meeting for the US Food and Drug Administration (FDA) at CHOP. A big part of our program is bringing in families of patients and inviting them to stand up on the podium and talk to the FDA. There’s usually 25-30 FDA reviewers in the audience, and so the FDA is getting feedback from parents about patients’ conditions and what the FDA should be interested in terms of approving devices. Sometimes the little problems aren’t as big as they are, and the parents can tell them that much better than I can. RDR®: As a pediatric physician of a rare disease, where do you see gaps in treatments for children with rare diseases, at least in your area of medicine? How do you think this gap can be filled? Campbell: There have to be multiple responses to this. We need to keep better track of the patients by forming registries—that’s something that we’re doing—and research, basic research. We have a research institution at our institute called The Center for Thoracic Insufficiency Syndrome Center. It includes basic science research, clinical research, and very advanced imaging so we can actually look at the lungs as they inflate and deflate—we can monitor that. That tells us the performance of the chest, and that’s never been done before. Now, we don’t just show an X-ray to the parents, we can tell them, ‘Well, this is working at 80% capacity,’ or ‘[It’s working at] 50% capacity.’ It really tells the parents what is going on. RDR®: What do you feel are the most important tools and information to pass on to young scientists, researchers, and physicians? Campbell: Don’t be afraid to take a chance. It takes someone that can start a marathon with no finish line. If it’s for a child, it’s worth it. Don’t be afraid. You can succeed. RDR®: Are there any new or up-and-coming treatments for rare diseases that physicians and patients should be aware of? Campbell: Oh, yes. In medicine, surgery works best when it’s preventive. Right now, we are working on a new generation of devices that halts diseases early rather than waiting for them to get advanced and then have to operate later. We can intervene in children as young as 6 months of age. We shouldn’t be waiting until they are 2 or 3 when they [have already developed] an advanced problem. RDR®: Looking back on all of the innovations and strides you made in your career, are there any specific comments you have? Campbell: I just want to say thank you. NORD gave us our start, our first funding. I wouldn’t be sitting here now if it hadn’t been for NORD all those years ago. They took a chance on us. I accepted a patient with a rare disease who started a very long series of complex surgeries. When we put the device in, we have to expand it twice a year. That’s just what we have to do right now, but that will change 1 day. What they’ve started is an incredible thing that is worldwide now. It provides hope. Now I can tell parents, 'Your child has a chance if we do this, but if we do nothing, I don’t think there’s much chance.' When we put it that way, it’s very scary, but parents need open discussions about their children’s problems. Every year I get graduation notices from kids in their twenties who were supposed to die in infancy who have VEPTR devices. That is just the best thing I could ever get. I’ve written an awful lot of checks to these kids through the years. For more news from the NORD’s 2018 Rare Impact Awards and other news from the rare disease community, subscribe to Rare Disease Report®’s eNewsletter.